CellularStream.com Blog: Samsung Transform and Sprint ID hands on. Samsung Transform and Sprint ID hands on. Sprint has introduced the latest Samsung phone on the network. It’s packed with Sprint own modification of the Android system – The Sprint ID, which is a pretty cool tool of setting your own customization to the phones and perfect for Android newbies. The phone looks like a crossbreed of the Galaxy S and the Epic 4G. 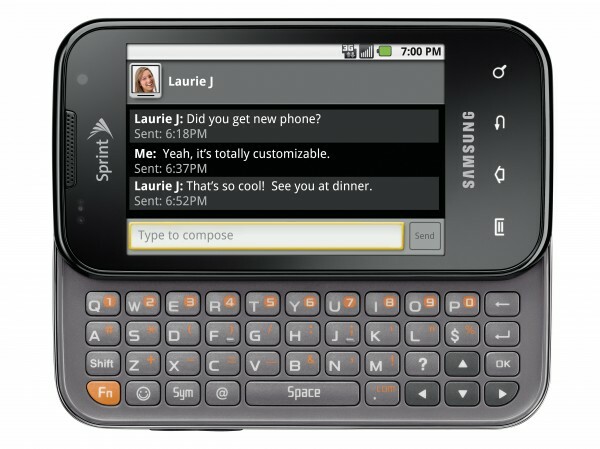 The phone has a 800MHZ processor with a 3.5” screen, cameras front and back (for you to have that “face time” with your favorite someone) and a full slide-out QWERTY keyboard. No 4G connectivity was introduced on this phone and that is a shame, the phone looks like the perfect executive phone and that 4G speed boost could be the right thing to add. Although the OS kind of looks likes the Froyo release it’s actually running 2.1, however the Sprint ID provided the visual changes that was done on 2.2 with its own little twist. In addition, many companies just fire an employee for theft and do not file charges. Our church discovered that an employee was embezzling money.